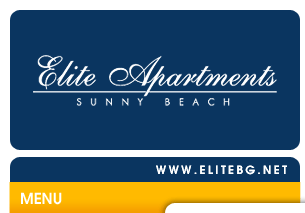 Hotel Elite Apartments is situated in a picturesque and green locality, 200 m away from the beach, on an area of 13 000 sq. meters . 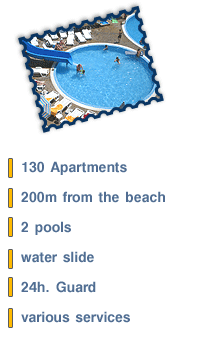 Own swimming pool for adults and children, cafe , restaurant, Internet Club and supermarket are available in the village. The hotel is fenced and with security available. 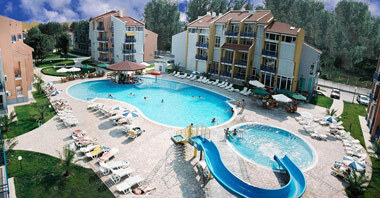 A cable TV, Internet and telephone line, garages and parking places are also provided there. Lovely and abundant greenery gives us the feeling of being in immediate touch with the nature. The modern architecture, with its glazed fasades in large numbers, provides the dwellings with sun and comfort. The hotel is built with modern construction materials corresponding to the European standards.